See the full ZMC ZAMAC offer. The key to our success in the very high temperature industry lies in being a highly qualified manufacturer. We are always ready to meet the needs of our customers. Vacuum formed profiles are produced on our precision made molds, therefore we are not limited in forming a wide variety of insulating element shapes. One of the branches of our business is production of insulation boards characterized by perfect parameters. After prior formation with desired thickness, we obtain a hard board ready for mechanical machining and installation. We produce resistive heating elements with parameters designed jointly with a client. For manufacturing of those products we use top quality raw materials and resistor alloys. Shapes are manufactured from aqueous suspensions of refractory fibers using the vacuum-forming method, with a precisely selected layout of binders (fire resistance according to arrangements). If necessary, additional protective coating can be applied on these elements. The wall thickness of the most frequently manufactured fittings is 5-50 mm. 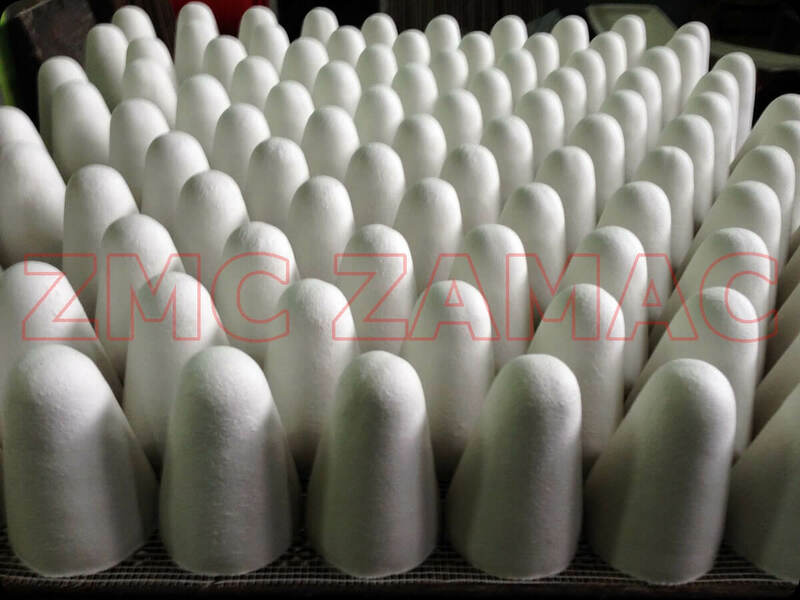 Due to vacuum-forming they are characterized by good mechanical resistance and low thermal conductivity. They are easily subjected to additional processing. The proper hardness and strength of the fittings ensures resistance to thermal shock and dimensional stability during operation. We are able to manufacture fittings in nearly any geometrical shape. The insulation boards are manufactured from aqueous suspensions of refractory fibers using the vacuum-forming method. The precisely selected layout of binders allows for the use of a minimal amount of (non-toxic) organic elements. They are removed during the first annealing, from the temperature of approximately 250 °C. As a result the board becomes completely odorless and returns to the white color. In terms of the classification temperature, we manufacture two types of boards: 1260 °C and 1430 °C. We invite you to check our products. A wide catalog allows you to choose the right product, both for repairs and for new projects. CSF, Fiber Plast are unique in the market. As a manufacturer we can create new recipes for individual solutions. The combination of insulating refractory fibers and high-temperature spirals results in efficient and durable heating elements. Our independent design and manufacturing method allow us to achieve the highest standards of our products. The shape of the panels, cylinders, half-cylinders, and the other elements allows for the quick construction of effective heating devices. Our heating elements are widely used in laboratory technology, goldsmithing, repair shops, foundry plants and all other applications where there is a need to quickly produce high-temperature in an environment-friendly manner. Zajmujemy się również przetwórstwem aluminium. Zapraszamy do wysyłania zapytań.